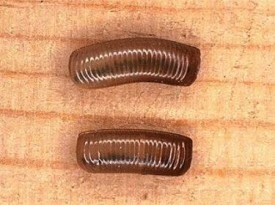 Two cockroach egg cases (eggs inside not visible). Yes, cockroach eggs are large enough to be seen by the naked eye. However, cockroach eggs are not usually seen individually because they are enclosed inside a case, called an ootheca, until the baby cockroach nymphs are ready to hatch and emerge in to the world. This egg case is about the size of a fingertip and shaped like a purse or bean, as seen in the picture. It contains between 10 to 40 cockroach eggs. Individual cockroach eggs are the shape of and a little smaller than a tic-tac. The ootheca is brown or black colored depending on the species of cockroach. The case is opaque which prevents one from seeing the cockroach eggs inside. So if your aim is to locate cockroach eggs you need to look for the ootheca in order to find the eggs. When the cockroach nymphs are fully developed, the mother cockroach deposits the egg case in a warm, moist, and dark location. These conditions are best suited for the development of the eggs. This may be in a crack or crevice, or buried shallow underground. Some species of cockroach do not drop their ootheca, but instead carry it to term until the cockroach nymphs emerge. A female cockroach may produce three or four ootheca in one year, each with its corresponding count off cockroach eggs. When the baby cockroach is born it is initially colored white. But after exposure to oxygen the nymph quickly turns brown. If you are looking for evidence of cockroach activity or infestation in your home, learn how to identify cockroach droppings rather than cockroach eggs. The females don’t attempt to hide feces like they do eggs so it is much easier to locate. Do Cockroaches Make Any Audible Noise?